The Medix Econoneb Nebuliser has a continuous rating motor, meaning it remains cool during extended and demanding use. This unit is reliable and durable and as such is ideal for meeting the challenges of hospital or clinic use, as well as at home. With its attractive, compact design, easy to use controls and top carrying handle, this lightweight nebuliser is a popular choice with all age groups. The Medix Econoneb Nebuliser has a high flow rate which ensures fast and effective therapy every time nebulising bronchodilators (relievers), corticosteroids (preventers) and antibiotics. 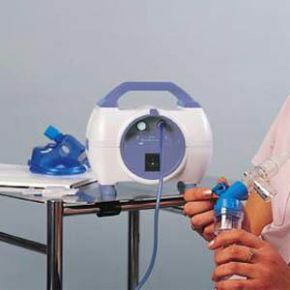 The Medix Econeb Nebuliser comes complete with ‘starter pack’ accessories and is ready for immediate use; simply plug into an electricity mains supply.